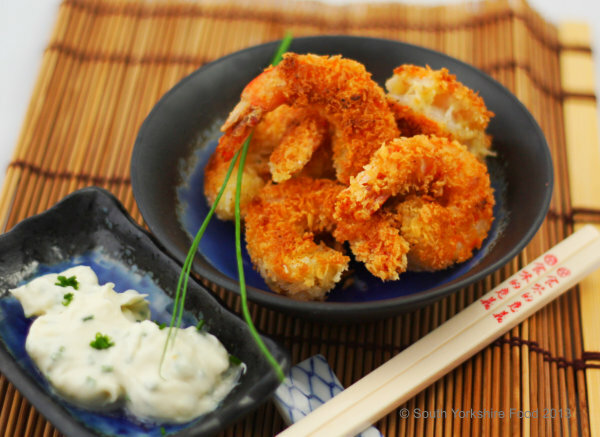 Panko is a variety of flaky bread crumb used in Japanese cuisine as a crunchy coating for fried and baked foods. It has a crispier, more airy texture than most types of bread found in Western cuisine and resists absorbing oil or grease when fried, resulting in a lighter coating. Serves 2, but for more just double up the amounts (apart from the egg which will be enough for a double recipe). First mix together all the ingredients for the Wasabi mayonnaise, and put the mixture in a small serving bowl, and set aside. Next, using a sharp knife, cut down the back of each prawn, remove the black intestine thread, and slightly open up the prawn. This is called butterflying the prawn. Dry off each prawn with some kitchen paper. Put the flour, the beaten egg, and the panko breadcrumbs, each into separate shallow bowls. Add the garlic granules, salt and pepper, to the panko and mix well. We do this because the flour sticks to the prawn, the egg sticks to the flour and the panko sticks to the egg! Heat the oil in a small frying pan to a medium heat - you can test this by dropping a few crumbs of panko into the oil - they should take a minute or so to go brown. Fry the prawns in small batches for 1-2 minutes each side, until golden brown, and cooked through. Serve with the Wasabi and Chive mayonnaise as a delicious snack.